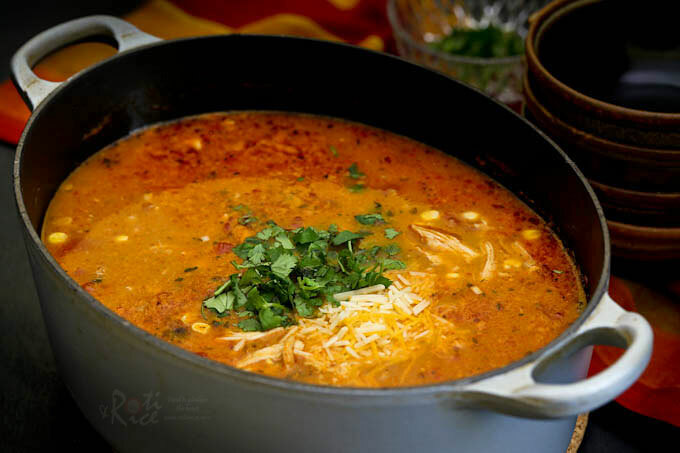 Easy to prepare creamy Chicken Enchilada Soup with shredded chicken, black beans, corn, diced tomatoes, and melted cheese. So comforting and delicious! 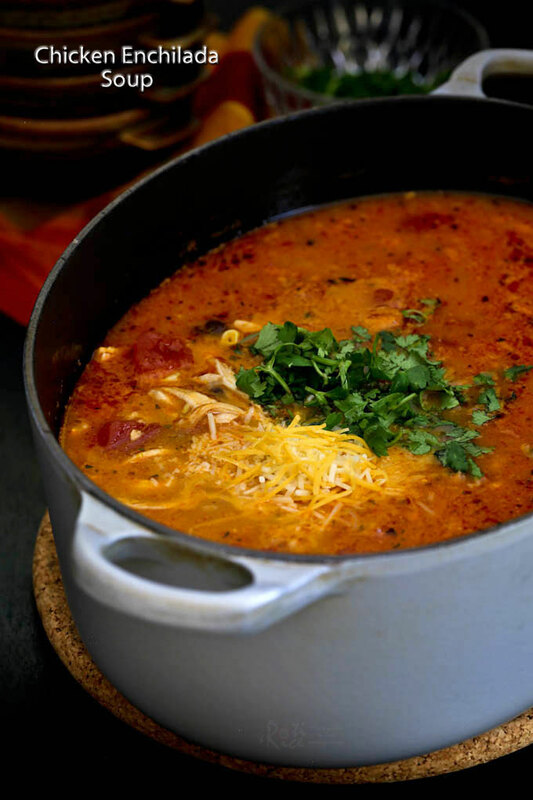 Would you believe that I have not tasted Chicken Enchilada Soup until very recently? It was quite a discovery for me and to make up for lost time, I immediately decided I wanted to replicate it in my own kitchen. 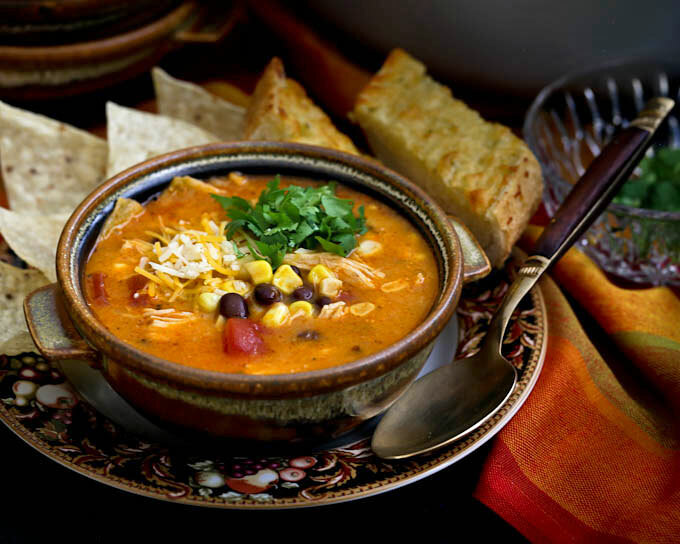 This soup hits all the right notes – creamy, spicy, and flavorful with lots of textures. It has meat and vegetables all in one bowl, further enhanced by the garnishes. Definitely a must try! The version that I first tasted was a little creamier and smoother. This recipe inspired by the one found on Serious Eats has a sharper and more tangy taste. It is chunkier in texture with whole black beans and corn kernels. This soup also has a richer color making it look very appetizing. For simplicity and ease of preparation, I use canned red enchilada sauce which comes in three levels of heat – mild, medium, and hot. I chose the medium which worked out nicely for our family. Please leave out the lime juice if you prefer the taste to be a little less bright and tangy. Heat olive oil in a large pot. Fry onions until softened, about 2 minutes. Add garlic and jalapeno pepper. Continue to fry for another 30 seconds. Add corn, black beans, chicken, tomatoes, enchilada sauce, and chicken stock. Stir to get everything well mixed. Bring soup to a boil over medium heat. Add salt, lime juice (if using), and shredded cheese. Stir until cheese has melted and is heated through. Turn off stove. 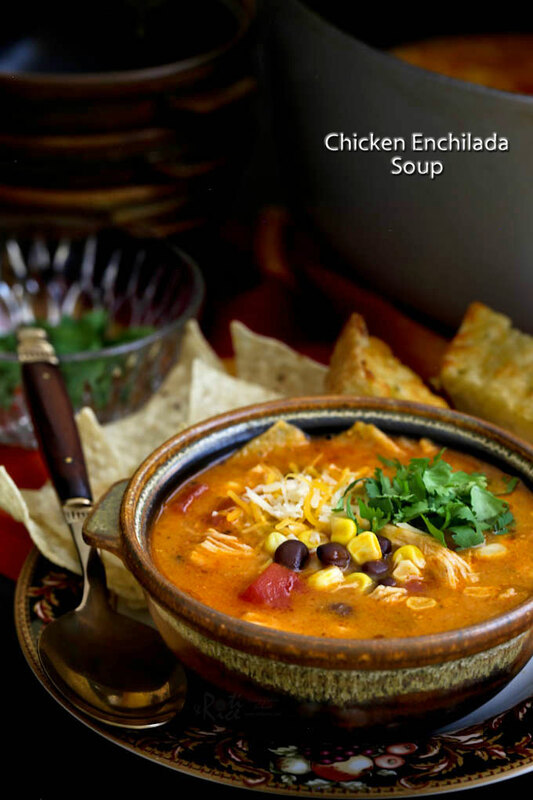 Serve warm topped with chopped cilantro, shredded cheese, and crushed tortilla chips. Since we had this soup as a meal, I served it with garlic bread and tortilla chips. It was truly delicious! I only wish to say thanks. This soup is so tasty that I will try it as vegetarian for my daughter!